Google’s announced a plan to update the billboards captured in its Street View service with new ones so the info is up to date no matter how old the image is. Of course, this is Google here, so they’ll be charging for the privilege. The notion is blindingly obvious, of course, but as Douglas Adams once wrote so is the idea of a cat flap–but somebody still had to invent it. And that doesn’t stop it from being damned clever. Every time a Street View camera whizzes down a street it gets exposed to all the advertising posters you or I see as we drive down it too. But while for us they’re merely a fleeting moment that leaves us with a yearning to have coffee with George Clooney, they’re captured forever by Google’s cameras. That means when you’re strolling the virtual streets of Street View, all the ads are out of date. Which is where advertising king Google steps in with the new plan. It’s going to devise a code bot that will automatically recognize physical adverts in Street View imagery, and then there will be a system that lets Google re-sell the same advertising space digitally so that more up to date info is presented to Street View visitors. 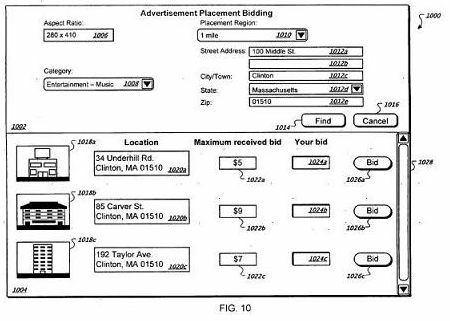 The technology is detailed in a newly-granted Google patent, but since the application has been in place for 18 months it wouldn’t be a surprise to learn if Google’s been working on the tech for a roll-out sometime soon. But there’re some bizarre implications of the tech that Google might have to iron out first. For example, it’s all very well to re-sell advertising space on, say, a billboard: You can imagine the owner of the original ad would like to update the spot, or someone else will supersede it with a different product, just as on a real billboard. But the technology also works on adverts like theater marquees or posters in shop windows, and Google seems to be planning an auction system for “unclaimed” digital ad placements–potentially leaving the spots free for rival services to advertise their wares on a competitor’s business. Street View on a smartphone would then be something of a surreal experience, with different and perhaps conflicting info displayed on the Street View world view versus what you can see with your eyes. Which might actually be one big weakness of Street View itself: As more and more of us turn to the mobile Web for data, Street View is going to be displaced by augmented reality apps–probably because these more closely relate to the real time world around you. 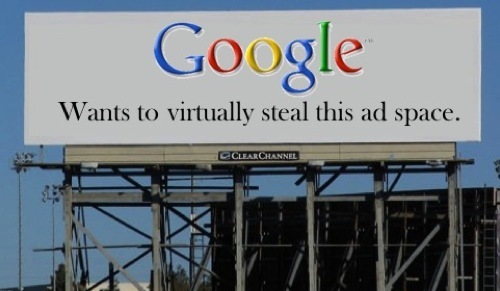 Google’s not quite worked its way into this marketplace yet…but when it does, imagine the legal kerfuffle if it tries to replace billboard ads with digital updates in real time. Mind you, with AR billboards becoming a viable tech almost as I write, this sort of issue can’t be far off.